Note: This essay has been prepared and written by Jānis Stundiņš, news agency LETA, by reasons of personal interests of local history. This article has been published in local Latvian papers and around the world in both English and Latvian. I would like to add comments, which has no direct connection with Count’s family living in Eleja. It was interesting to recognize one image in the photos – a painting that is seen in catalog of prestigious art auction. This same painting is hanging in Rundāle palace too, but it is a copy. 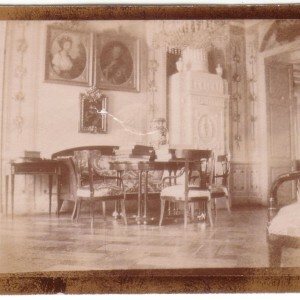 There are many photos of the interior of the castle among the Ned’s family photographs. My attention was attracted by an oval portrait of the Duchess Dorothea because I’ve recognized the classic painting by Angelica Kauffmann, sold in 2009 at a Sotheby’s auction by 134 500 US $ (see attached image gallery). Was that the Eleja’s painting sold at auction? Did the palace of Eleja have the original or a copy? In the Sotheby’s catalogue the name of one person in the history of the painting raised suspicion. The last original owner of the painting is mentioned as the son (Louis-Napoléon, 3rd Duke of Talleyrand-Périgord) of the daughter (Dino, Duchess of Sagan) of Dorothea, Duchess of Courland (the wife of Peter von Biron, Duke of Courland and Semigallia), which makes him the grandson of the Duchess. In 1899 the painting was found in the art salon “Keller & Reiner” in Berlin, and was unheard of until 1946 with a new owner – Zacharie Birtschansky in Paris, who in 1946 presented it as gift to the Los Angeles County Museum of Art (USA), which finally sold it to benefit future acquisitions. By this history it seems that this painting could not have been in the palace of Eleja, but there is suspicion about Birtschansky ownership in 1946. According to other sources, the same Zacharie Birtschansky was artistic advisor to Walter Andreas Hofer and Bruno Lose – the art dealers of Hitler’s government leader Hermann Goering, and this business sometimes has been associated with stolen artwork during the war. Specifically, in the activities of Birtschansky there was found that he provided false or misleading information regarding the paintings’ history of ownership during the war, as for example, such was done with Edouard Manet’s painting “In The Conservatory”, which has later reached the collection of Berlin State Museum. 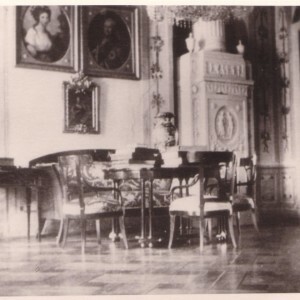 However, the oval portrait in the Eleja’s library photo is in question, because as it is known, the palace was burned and destroyed during the First World War. During the Second World War it was already in ruins and some of the paintings could still have been there. Here we see the lack of possibility that German soldiers could have stolen it. “The varnish seal of Hohenzollern-Hechingen on the back of the painting indicates that it was inventoried in the period when the palace of Sagan was owned by Hohenzollern-Hechingen Princess Pauline, but unlike many Kauffmann paintings, which Pauline’s son Konstantin took out of the Sagan and later sold, this portrait remained in the palace.” explained Lancmanis. However Eleja’s painting has not been sold at auction, but this does not exclude the possible history of the original painting’s “mystical” period from 1899 until Berlin in 1946, when Birtschansky simply donated it. It is possible that the original painting may have been quite legally obtained in the collection of Hermann Goering, and this fact simply “disappeared” from its history description. This suspicion of the portrait of Dorothea has been examined by a U.S. university study. 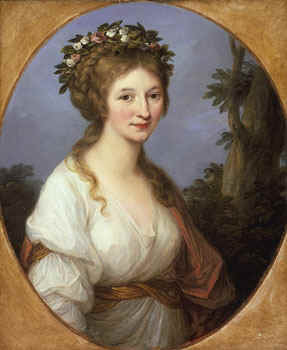 Note: The following information has been given to me by the current owner of the portrait of Duchess Anna Dorothea von Medem by Angelica Kauffmann, Mr Fredrik Rosenlew. I have expanded on his information with full details and names. If you compare the Elley frame with the frame of the portrait bought at the Sotheby auction [above], you will notice a difference – there is no decoration above the frame on mine. My conclusion is that the Elley-painting was a replica or copy of this one, and was destroyed when the castle was burnt down. There must have been three portraits made. One for Dorothéa herself and one for each of her two brothers Karl and Christoph (the youngest brother, Johann, was already dead at the time the painting was made). 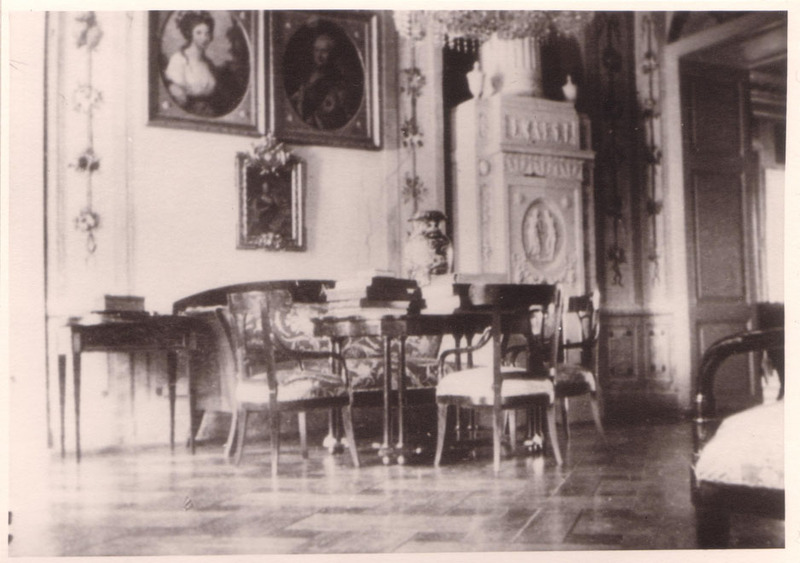 Both brothers owned castles in Courland, among them Elley (Karl’s) and Remten (Christoph’s). The Remten painting is the one that Theodore de Medem owns. Theodore and I know this as the frame of the Elley painting was a little different from our frames. The signatures on the replica paintings the brothers had is only ”A. Kaufman” nothing more. On mine it is ”Angelica Kauffman Rome pinx 1785”. This indicates that the paintings for the brothers of Anna Dorothea were replicas but almost certainly made by the artist herself at the same time (not uncommon). They are alike in almost every detail. My painting must have followed Anna Dorothéa (or her eldest daughter Wilhelmine, and second eldest Pauline) to Löbichau and the castle of Sagan. 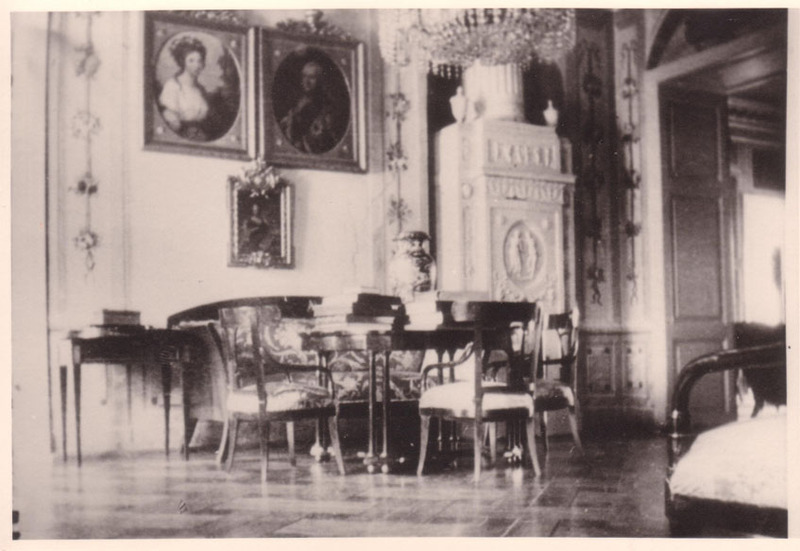 It was after Wilhelmine’s death that Pauline inherited Sagan and sold the castle, duchy itself, and presumably the painting to the youngest daughter Dorothée (who married Talleyrand). 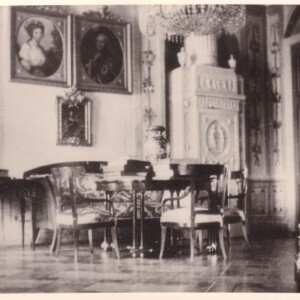 There is a Hohenzollern stamp at the back of the painting indicating that it has belonged to Pauline and her husband at one point. The best explanation of the existence of the stamp is that the painting has come to Pauline with the Sagan castle and then sold to the youngest sister. At some stage the painting was removed from Sagan and taken to France, to Valencay castle (which was a Talleyrand property) by Dorothée or her children. 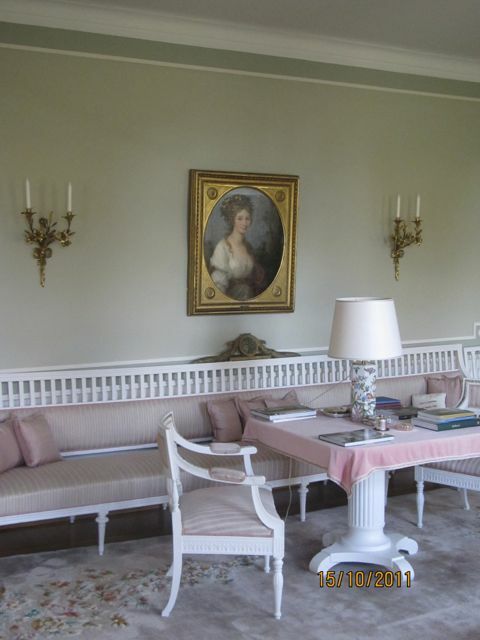 In 1899 the contents of Valancay castle was sold at auction, including this painting and including a painting of Wilhelmine as a child (also by Angelica Kauffmann). The Wilhelmine-painting has been lost since that auction. Theodore de Medem inherited his from his grand parents who had managed to get it out of Remten and into Germany in 1919. The mysterious period between 1899 and 1939 (1946) is still disturbing. We do not know from whom Birschansky bought the painting (and what has happened to the child portrait of Wilhelmine). Possibly there were different buyers already in 1899 at the Talleyrand auction. The portrait of Anna Dorothea landed in Berlin at an art gallery and was sold from there to an unknown collector and was not rediscovered until in the 1930s. In 1939 it is suspected that Zacharie Birtschansky shipped the painting, first as a loan, but finally as a gift to the Los Angeles Museum of History, Science, and Art in 1946 (Los Angeles Museum of History, Science, and Art, Notice of Incoming Shipments, 9-4-46). The accounts from an unidentified person at Los Angeles County Museum of Art (LACMA) on December 31 1953 to S. J. Cerillo of the Hudson Shipping Co., New York reads: “By SS ‘Normandie’, March 25th, 1939, we consigned to you—8 cases marked by B.Y. 89/96—containing paintings for account of Mr. Z. Birtschansky. We understand from Mr. Birtzchansky [sic] that these paintings have since that time been stored for his account in USA.” The letter notes consular invoice form 139, no. 5623, March 24, 1939, issued by the American Consulate, Paris. The contents of this shipment are unknown. Finally the portrait of Anna Dorothea landed at the Sotheby’s auction and from there back to a descendant, to me. 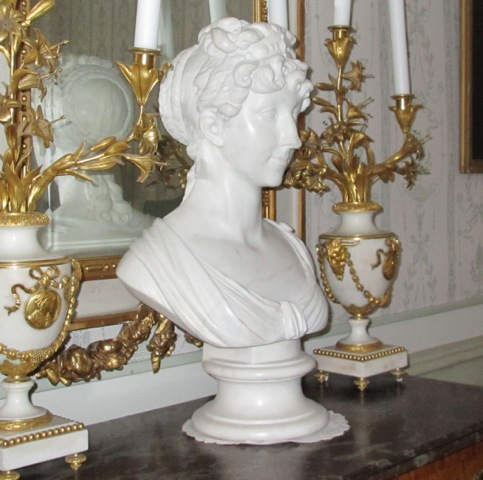 The portrait of Anna Dorothea now hangs in my house (a manor house built in 1763) Paddais Estate, Sagu-Sauvo, Finland, together with a marble bust of Anna Dorothea said to be by Antonio Canova (no signature but by Christies experts labeled as by AC or followers) and purchased by me directly from the Talleyrand family about 10 years ago. 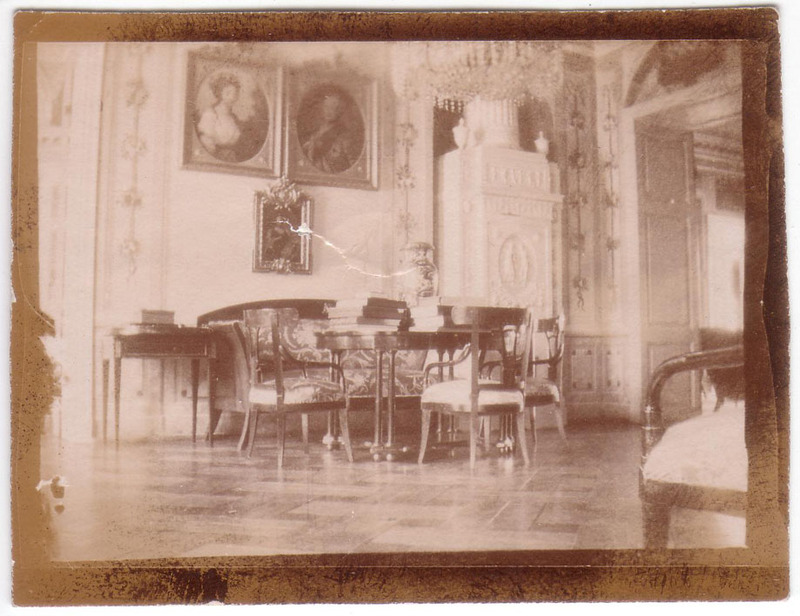 The interior and furnture of my house are to the largest part from the end of the 18th century. Both pieces of art fit in well in this surrounding which is contemporary to the painting and bust. Additionally, as I am a direct descendant of Anna Dorothea through her daughter Wilhelmine who had the one and only child with Count G.M. Armfelt (outside his marriage but brought up by him in Finland and adopted by him). The Armfelt-estates are only 20 km away from here. Anna Dorothea was my grandmothers grandmothers grandmothers mother (7 generations), the whole chain being only on the female line. Understandably I am most happy that I have been able to buy the painting (by Angelica Kauffmann) back to the family, after the debacle in France when so much was sold to unknown and unrelated buyers. I hope that these beautiful pieces of cultural heritage will be preserved and owned forever by descendants. There are good odds that future owners also will be inspired to take an interest in the lost but so rich cultural heritage of Kurland. A duchy that once was more than just a province, in fact it was like an independet country with quite a fascinating history of its own. The chances are there, as the estate I take care of, has been in the Rosenlew-family ownership since 1652 and as far I can see will remain so. Private ownership sometimes has a better track record than public!